Date Duration Calculator is a free date to date calculator to calculate duration between two dates or two times, you only need to input two dates or times, it can quickly calculate "how much days", or how much hours, minutes, seconds, milliseconds and weeks. 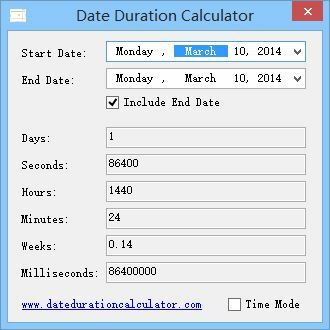 If you often need to calculate interval days in daily life or work, this compact software will be a handy helper on your PC desktop. 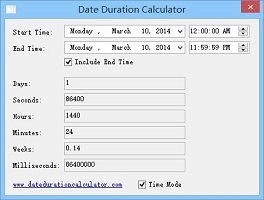 This calculator have tow modes: Date Mode and Time Mode, the Date mode is default, you can calculate duration between two dates, moreover, in this mode, you can use this software as a due date calculator, for example, set Start Date as today and End Date as due date, you can know how many days by the due date; or calculate reverse due date, set set Start Date as an old date and End Date as today. 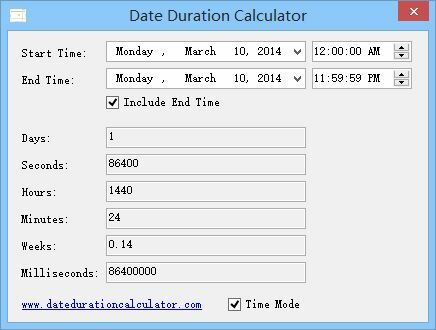 In the Time Mode, software will turn into a time duration calculator, you can calculate duration between two times. This software is a freeware, free to use.